While we were in Hawaii this summer, I perused the cook books in the hotel gift shop. I was fascinated to learn of a baked banana pie. 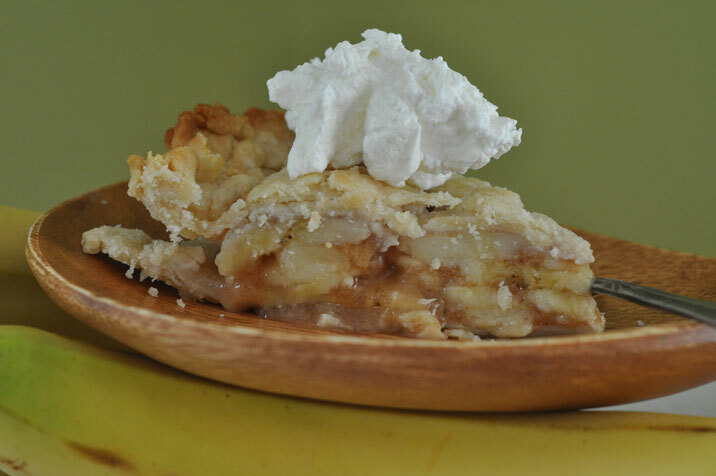 I know all about banana cream pie, but I have never seen or heard of a baked banana pie- have you? Could bananas really be baked in a pie? Would it actually taste good? Amazingly, I was able to memorize the recipe. At home, I found the exact same recipe in my Dessert – Favorite Recipes from Home Economics Teachers cookbook. This pie is a lot like making an apple pie, but easier, as bananas are much easier to peel than apples. Marinading them in pineapple juice is very important I think, not only to keep the bananas from browning, but it adds a heavenly dimension to the pie. I will be making this pie again soon- it was utterly delicious. According to my friend Amy McDaniel, who has been recieving a different pie a month from me for a couple of years now (since she won this item at an auction), the baked royal hawaiian banana pie is the best one ever & they would take one every month. She slept next to it in bed to guard it from her five hungry children….High praise, indeed. Slice bananas and cover and gently toss with pineapple juice. Let sit 30 minutes. Drain and gently toss with sugar and cinnamon. Place bananas in uncooked pie shell and dot with butter. Put on top crust and seal edges. Vent the top with some slashes near the middle. Bake at 400 degrees until the crust is golden brown, about 30 minutes. Hilo pie is another Hawaiian style pie. 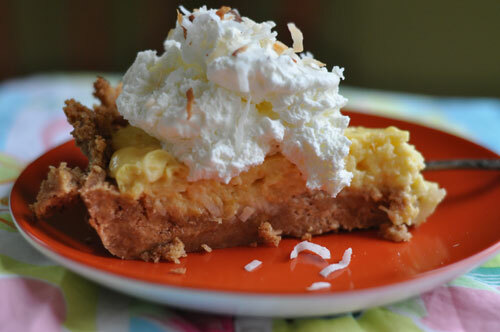 It has a graham cracker crust & creamy pineapple/ coconut filling. I rather cheated on the topping, but I don’t think it made much difference. It was pretty yummy, too. Make a graham cracker crust by mixing together graham cracker crumbs, 4 t. sugar and butter. Press onto bottom and sides of pie plate. Chill. In a saucepan, mix together 1/4 cup sugar, cornstarch and salt. Mix together the evaporated milk and water & stir into the dry ingredients. Cook, while stirring constantly, over medium heat until thickened. Remove from heat. Stir a little of the hot mixture into the egg yolks and then add yolk mixture back to the hot mixture. Cook for 3 more minutes, stirring constantly. Cool. Add vanilla, coconut and pineapple. Fancy topping: Chill evaporated milk in ice cube tray until icy. Whip until stiff in chilled bowl with chilled beaters. Add lemon juice and whip. Fold in sugar. Cover over pie just before serving. Garnish with pineapple and coconut.